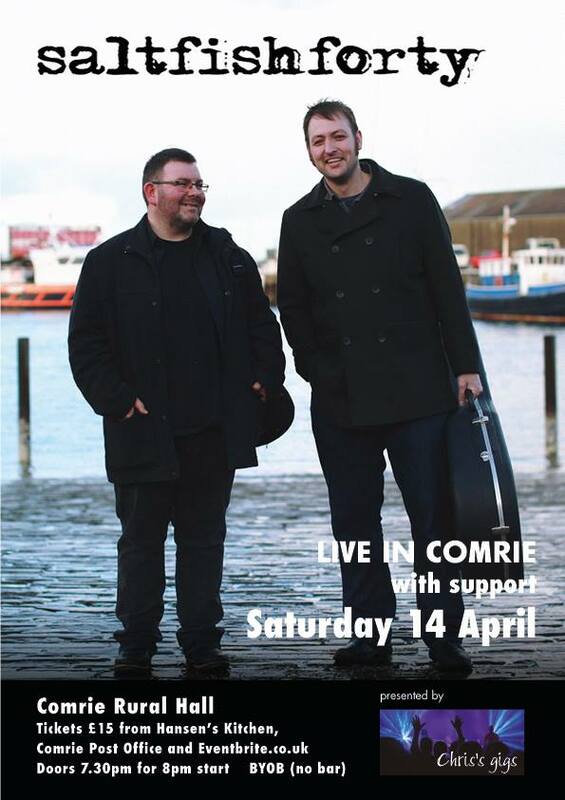 Chris’s Gigs is thrilled to be hosting a unique concert from Saltfishforty, the dynamic duo from the Orkney Islands. We’ve been trying to get this pair for ages and we’re very excited that we’ve finally managed to persuade them to come to the village. Get your tickets quickly because we will sell out and people will come a distance to hear them. Douglas Montgomery (fiddle/viola) and Brian Cromarty (songs/guitar/mandola) combine the rich traditional music of Orkney with original compositions. The powerhouse partnership has won a devoted following throughout the UK and beyond, brilliantly transcending the duo format’s conventional confines. A partnership forged back in 2002 – more by accident than design – the two knew each other since primary school, and played together in sessions and various bands, until they were booked in a four-piece for a charity gig, and only the two turned up: “We decided to go on and just make as much noise as two people possibly could – which is kind of how it’s been ever since”, they say.